Venha desfrutar dos belos pores do sol na varanda da sua varanda com vista para o rio e fica encalhado em um estado relaxante enquanto escuta a água que flui sobre as depressões abaixo. Vocês serão a poucos passos do acesso ao rio ea uma curta distância a pé do Bufford Beach Park com natação, play e áreas de piquenique e um lançamento de barco. A propriedade está localizada a poucos minutos da "cidade velha" Hardy, um passo atrás no tempo, com lojas antigas e especializadas, lojas de artesanato e recanto de presentes. O Rústico Lodge possui 3 quartos e pode acomodar até sete. O banheiro tem uma banheira de imersão encantadora com um chuveiro embutido. A grande cozinha, sala de jantar e sala de estar tem belas vistas sobre o rio. Um grande deck da frente da casa também oferece vistas do rio abaixo. O Spring River fica a poucos passos de uma ótima pesca, natação, canoagem e caiaque. Esta encantadora propriedade de férias francesa está situada em uma encosta arborizada, ajardinada com áreas de pátio privado cercadas por jardins e um córrego na encosta que flui suavemente em uma lagoa de koi estofada. Perder-se na atmosfera tranquila e relaxante nas terras bem cuidados com assentos por toda parte. Esta propriedade é a localização perfeita para um casamento íntimo, férias em família, reunião ou retiro, para passar uma lua de mel, aniversário ou uma escapadela romântica, ou a base perfeita para a pesca, canoagem ou rafting. Estes aluguéis noturnos / semanais são o local perfeito para você na histórica "cidade velha" Hardy. Our family of 6 spent three days at the Lodge in Hardy, just prior to Thanksgiving. 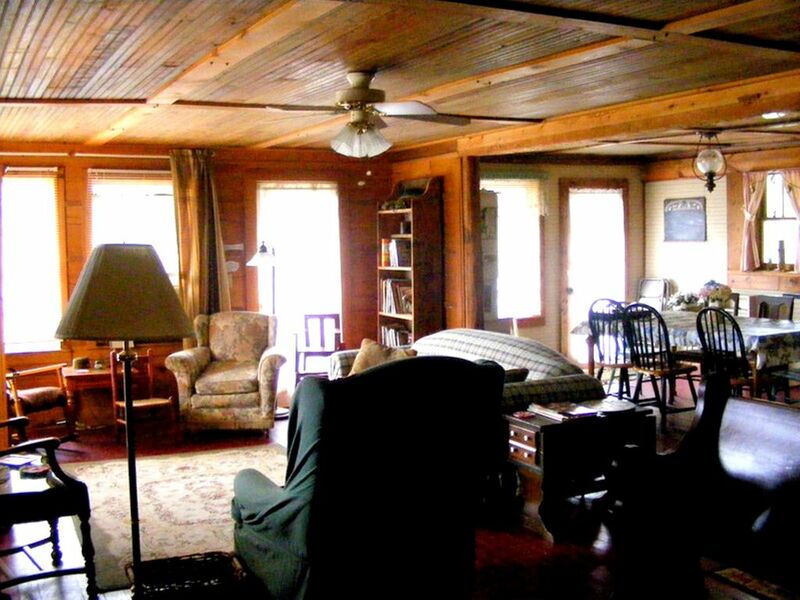 The Lodge is very comfortable and pleasant, and also has a million dollar view of the Spring River. It was well supplied with anything a guest could want. The wall heater kept all rooms amazingly warm, in spite of 30° temperatures in the evenings. We enjoyed playing the board games (Clue, a variety of peg games like Tic Tac Toe and others) supplied by the host and enjoyed the gorgeous floral arrangement that graced the dining room table. Accommodations were very comfortable. The only drawback was only having one bathroom, but that wasn't much of a problem, as it turned out. I am very grateful that our family could stay in such a unique setting, rather than a sterile feeling chain motel. It was a very charming setup. And we loved being able to hear the train, as well as the river. Very pleasant and enjoyable! The house was easy to find, very close to downtown Hardy, and had everything we needed. I'd definitely recommend it for someone needing 3 bedrooms. This is an amazing rustic lodge with cute country decor. It has the perfect view over looking the river, plenty of space for a large family, stocked with everything from games, puzzles, magazines, laundry detergent, snacks and even a bottle of wine. It's conveniently located close to Hardy's historic downtown. We will definitely be back!! We had a wonderful family stay in the French Chateau(1197301) and the French Manior(1262289)! Amanda Himschoot was a very thoughtful and gracious hostess during our stay in her lovely property overlooking the beautiful Spring River at the falls in Hardy, Arkansas. Amanda was very helpful and kind in seeing that we had everything we needed to be comfortable. We had a very memorable and fun-filled stay! We look forward to returning and listening to the soothing sounds and enjoying the beautiful views of the river from this property!